Most of the mall cell phone kiosk is built with plywood and lamination finish based on different kiosk design and different kiosk budget price. The material used on the kiosk is the key cost due to the price. Another type of kiosk is built with MDF in baking panting finish. 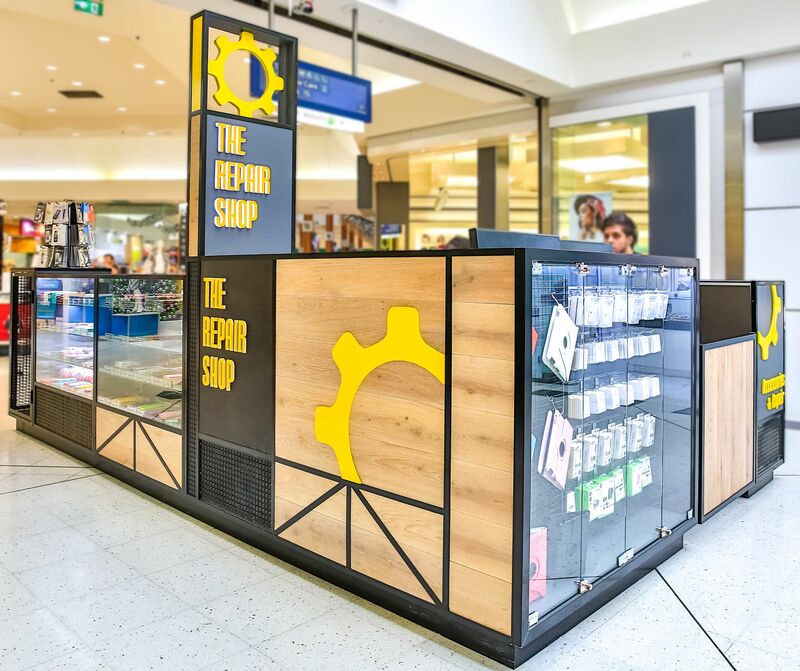 This type of retail kiosk is in good looking but the kiosk is very heavy and not last as long as plywood kiosks. 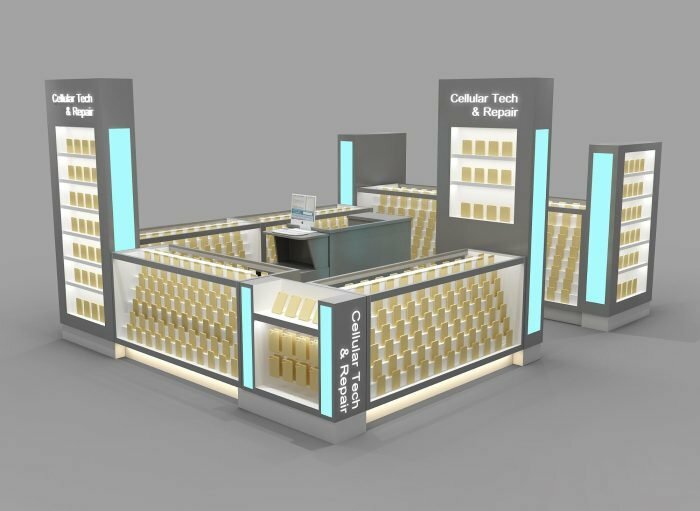 How to start a cell phone repair kiosk business? Phone repair stall in mall also known as cell phone fix kiosk. Mainly doing screen repair and cell phone covers retail business. 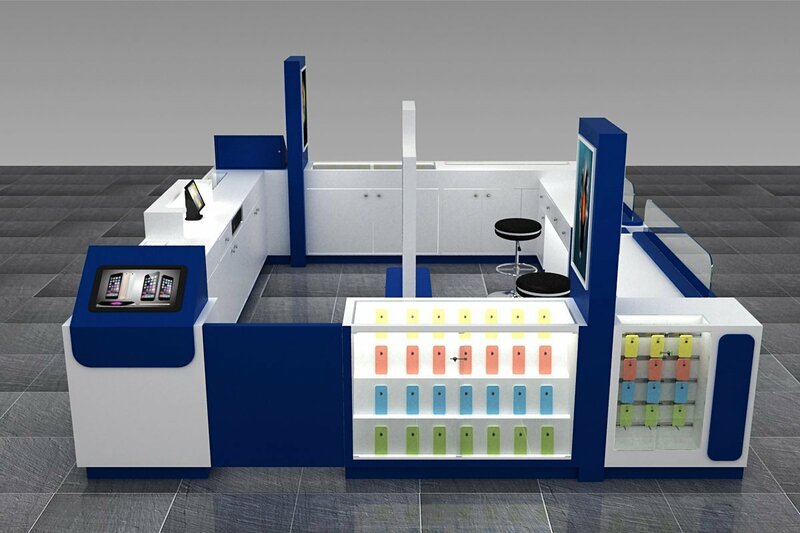 So when design a mobile phone shop .we need as much display showcase as possible. Because every owner has thousands of different accessories to display. On the other hand. 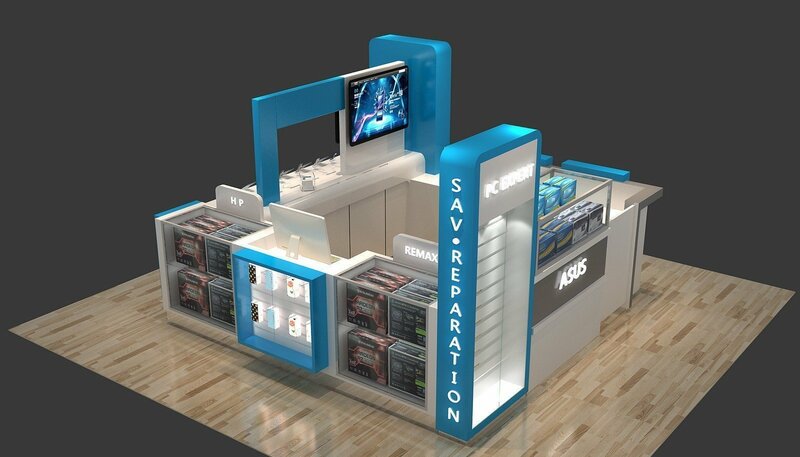 A cell phone repair kiosk is also an accessory and covers retail store. Both are very good business ideas in mall now because everyone owns one or more cell phone with him. talking to mall manager get a lease. 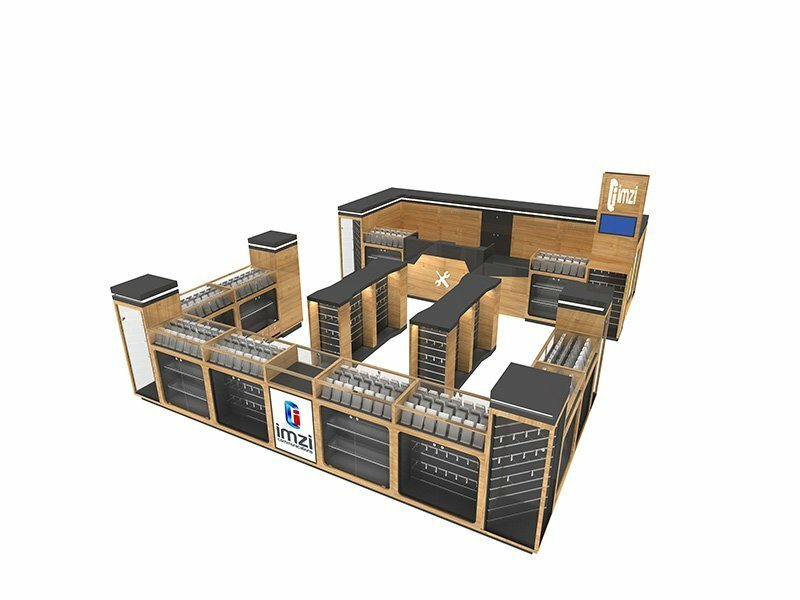 find a design company to design your shop. 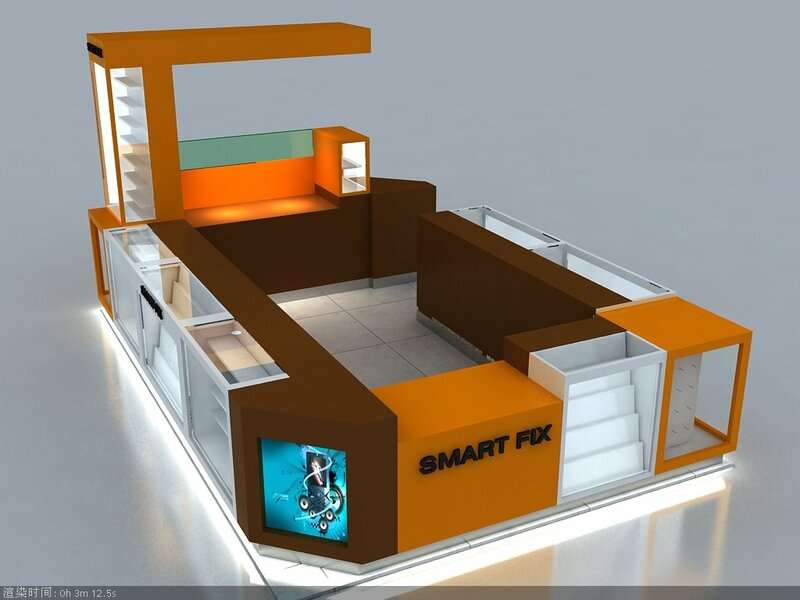 get a commercial furniture manufacturer to build the kiosk. install the kiosk in limited time. hire workers & start retailing. 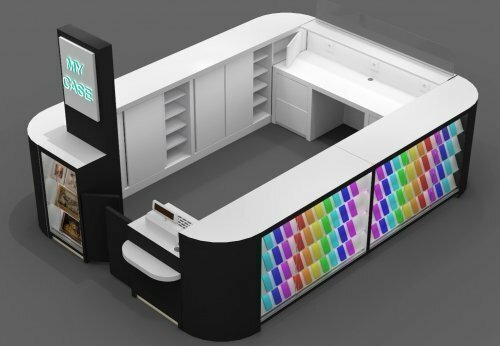 UNIQUE supply customized mall shop kiosk stations for indoor store & outdoor shop . 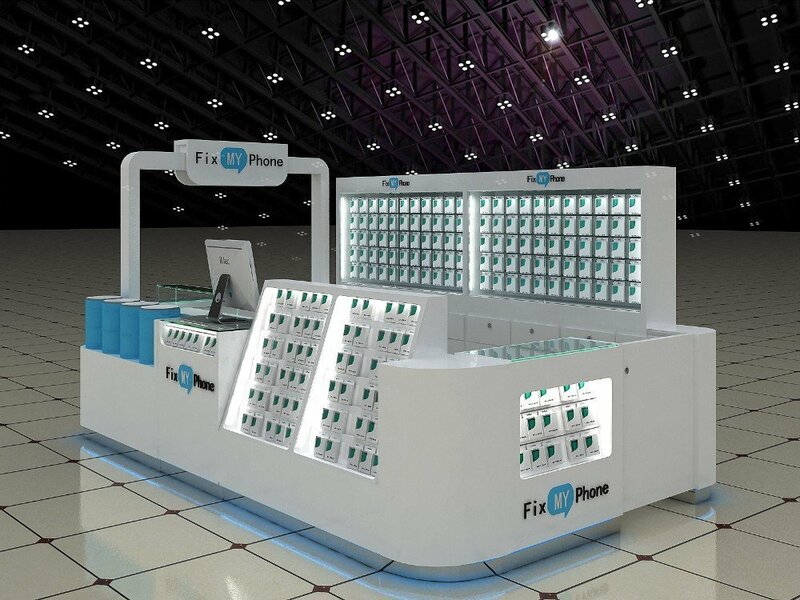 We custom wooden cell phone repair kiosk for sale. 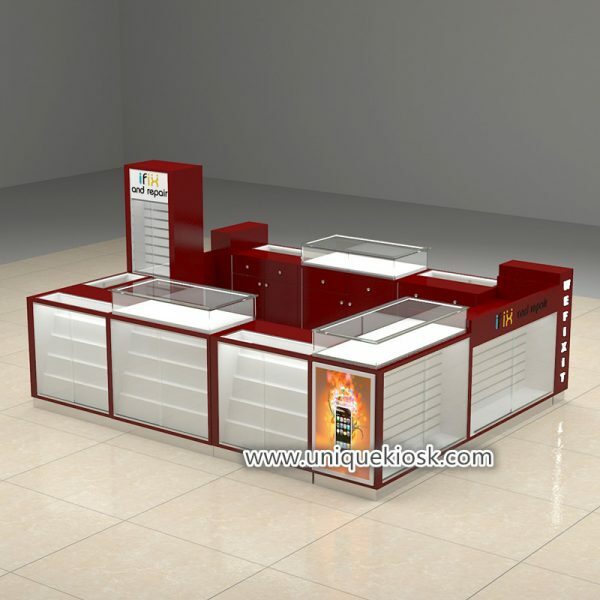 And have been design & manufacture mall retail kiosk for over 20 years. Our high quality products are shipped and installed all over the world. 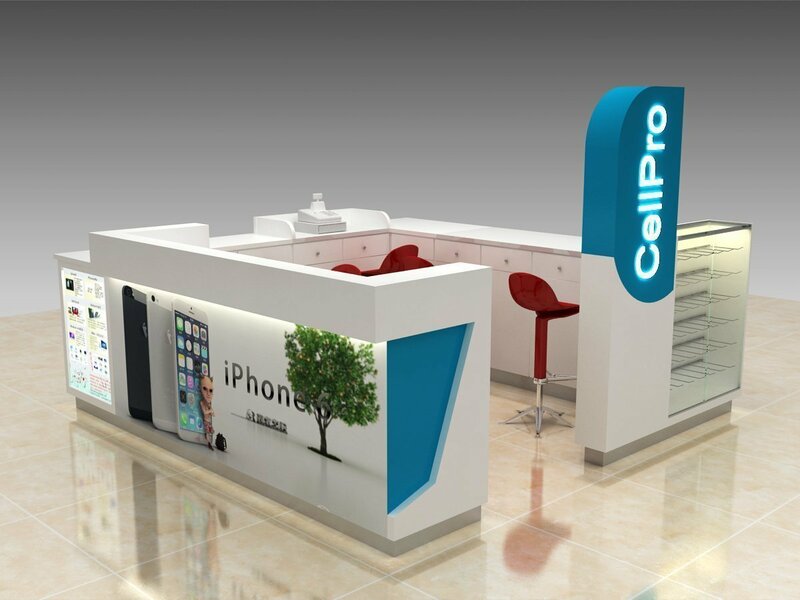 If you want to start a cellphone related business in mall or you want find more kiosk design for cell phone retail or fix , welcome to give us a email. Best horse need a best rider. 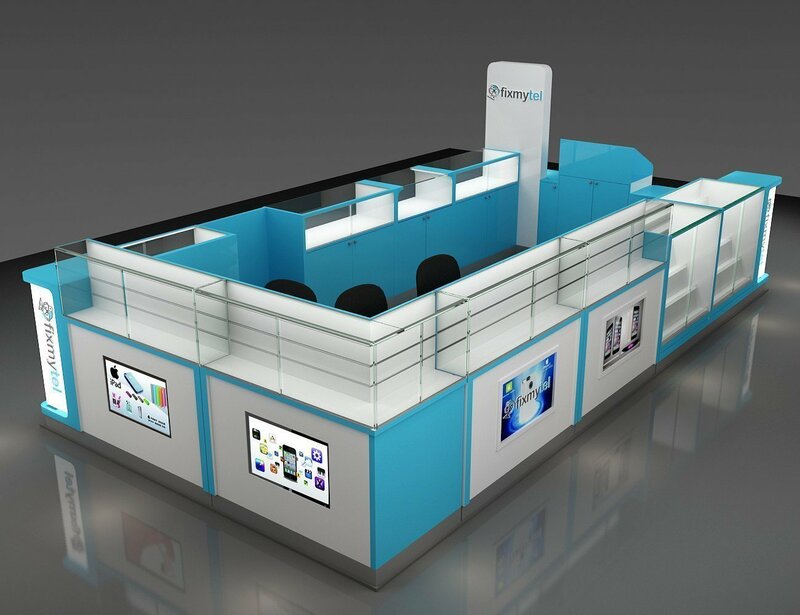 While a great business ideas need a best kiosk to operate. So , invest time , money & effort on a high quality kiosk cabinet is the most valuable “homework “. 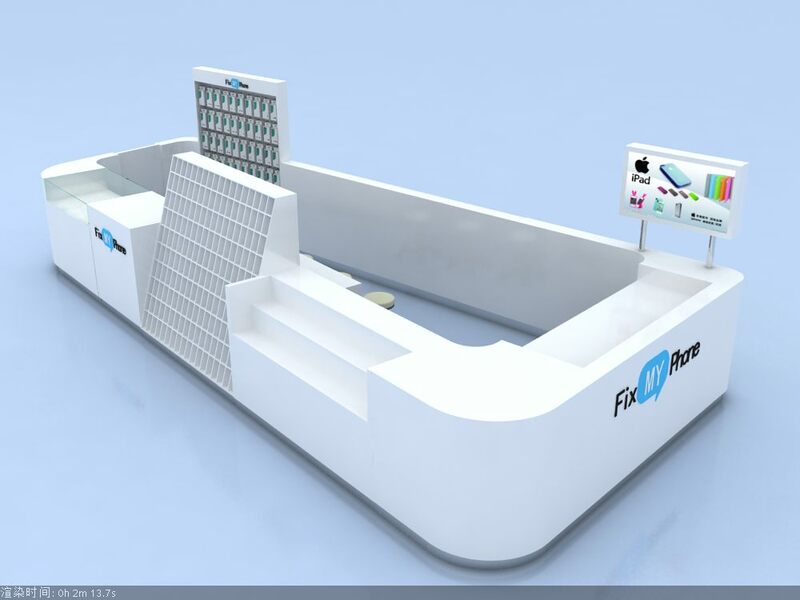 In order to get a customer satisfied retail kiosk. We have made a detailed procedure for kiosk ordering. 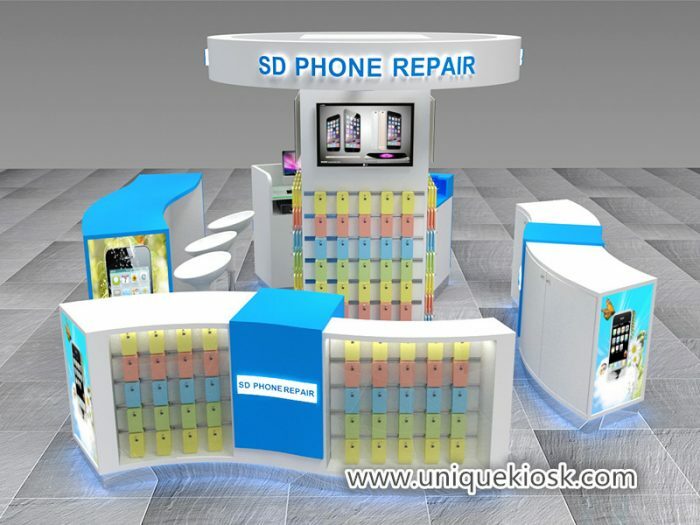 How to order a customized phone accessories & repair kiosk from Unique Kiosk? 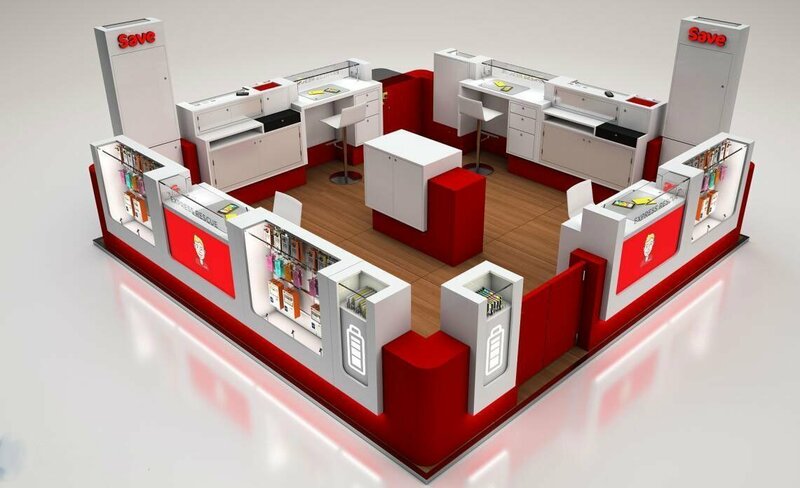 1.Talking all the details and requirements to start a kiosk design. The design includes 3D rendering and construction drawing. 2. Submit drawing to mall office and get it approved. 3. After you pay the deposit of kiosk, and we start building the kiosk. 4. 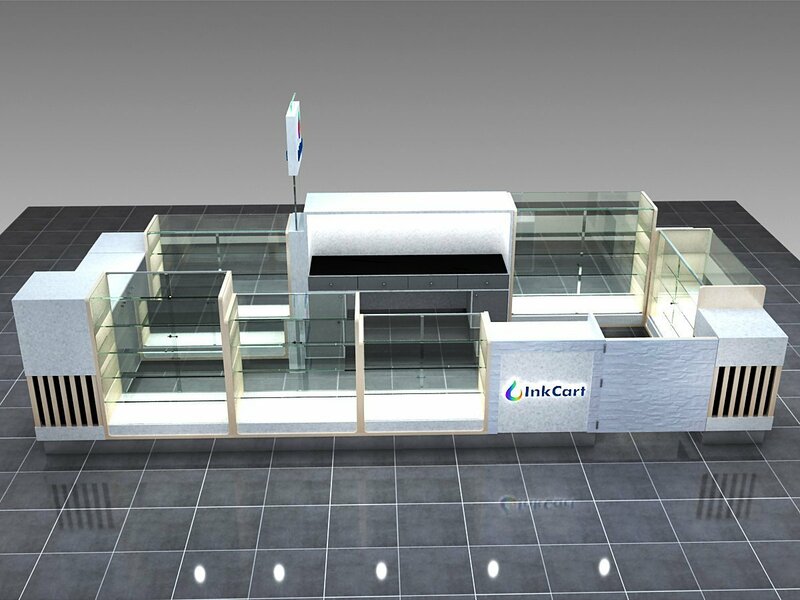 All kiosks are built exact following confirmed construction drawings (include material, size, and finish). 5. After kiosk finished, we will assemble it in our factory. You can visit our factory to check or we show you the video. balance payment should be paid after inspection and approved. 6.Shipping support & After sale service started. 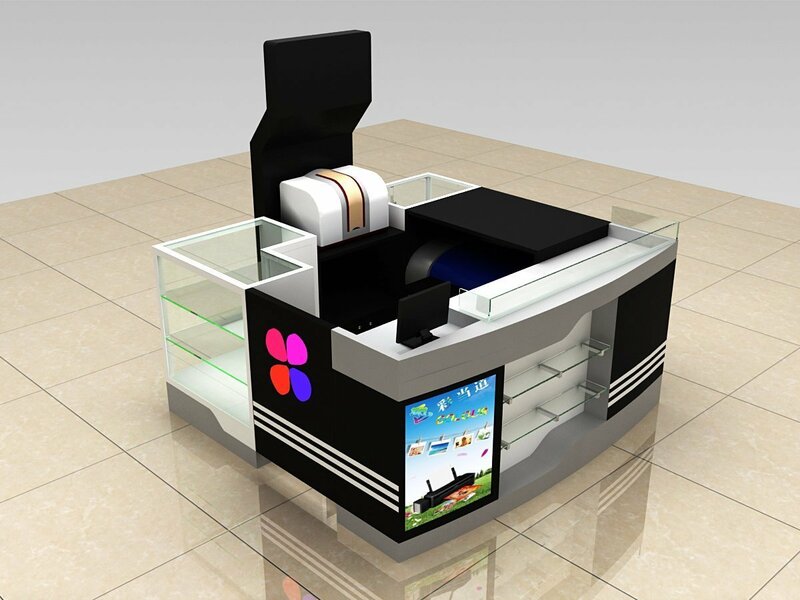 Unique Kiosk has been designing & Manufacture cell phone repair kiosk since smartphone appeared in the market. 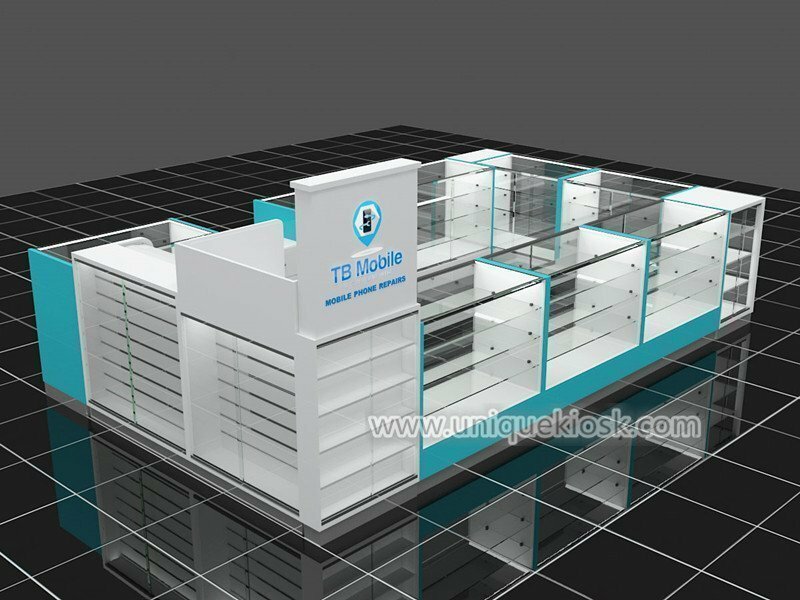 We provide a unique kiosk design for electronic accessories and digital retail in mall. 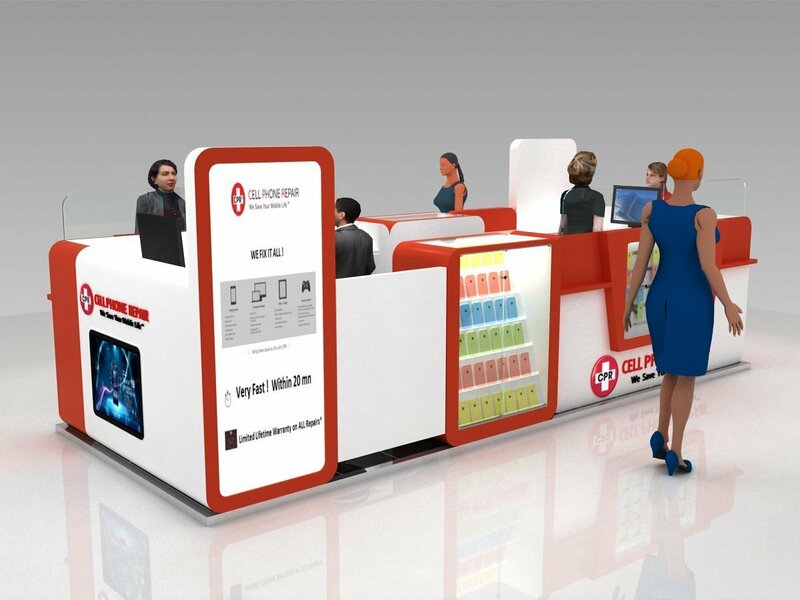 If you are looking for a modern style business kiosk for cell phone or electronics. Unique will be your best choice.